I wrote this story for the Houston Chronicle. It was published on Aug. 25, 2006. (See original version). 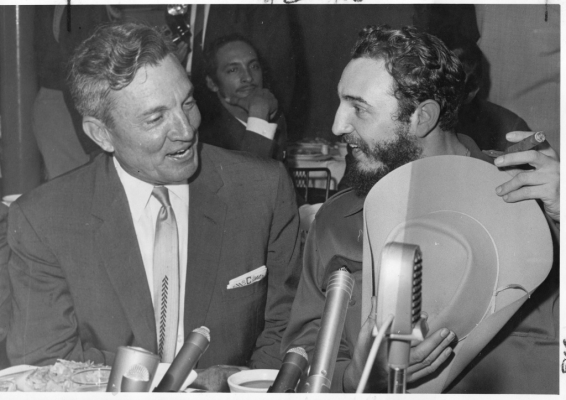 Before the Bay of Pigs and the Cuban Missile Crisis, before Washington branded Fidel Castro a villain, the Cuban leader swept into Houston a conquering hero. The Houston mayor shook his hand. Business leaders cheered. And ranchers gave him a prized quarter horse. Castro’s fleeting trip to Houston remains a significant, though often overlooked, event that even now provides valuable insight into the Castro dynasty that has ruled Cuba for 47 years. While in Houston, Fidel Castro, then 32, had a fiery confrontation with his brother Raul, then 27, that would influence the course of the revolution. Witnesses eavesdropping outside the Castro brothers’ 18th floor suite couldn’t make out exactly what they were saying but think they were fighting about how the revolution ought to proceed, Latell said. The two brothers denied having a falling-out. To be sure, the brothers found a way to work together, going on to dominate Cuba for nearly a half century. Then last month trouble came. Fidel, now 80, ceded power to Raul, 75, then underwent emergency intestinal surgery. Some Cuba watchers called it the beginning of the end of the Castro era. But others predicted the socialist regime would endure. In his first public comments since then, Raul Castro hinted Aug. 18 that he’s ready for talks with Washington. But U.S. officials snubbed him, calling him “Fidel Lite” and predicting his government will be no better than Fidel’s. Raul Castro’s longtime reputation is that of a hard-core socialist who ordered the executions of civilians who collaborated with the enemy in the 1950s. But Latell said he thinks Raul is more complex. During his visit to Houston, his only trip to the United States, Raul seemed sullen and withdrawn, showing little interest in engaging the Americans. But Fidel went out of his way to charm his Texas hosts, posing for photos and joking about how much time and money he saved by not shaving off his now famous beard. Houston residents gave him a standing ovation when he arrived for his overnight stay April 27, 1959. Some dressed their children as rebels in his honor. Houston businessmen talked excitedly about making a movie about the Cuban revolution with Marlon Brando starring as Fidel Castro. Castro had just finished an 11-day swing through New York and other eastern cities. He had met with then-Vice President Richard Nixon. He was as close as he’d ever get to having peaceful diplomatic relations with the U.S., as some saw it, and didn’t want to upset the Americans. At least not yet. And he was angry with Raul, who evidently wanted to step up the pace of the leftist revolution and dispatch Cuban guerrillas into other Latin American nations. And Raul Castro, he said, is more flexible, more open, than his older brother. Carlos Franqui, 84, a writer and poet who headed the clandestine newspaper Revolucion and Radio Rebelde during the Cuban revolution, agreed. In 1959, he was president of the Jaycees in Houston. He said then-Sen. Lyndon Johnson had asked the Jaycees to invite Fidel Castro to Houston; U.S. politicians “wanted an apolitical group to deal with his visit,” Wall said. A week before Castro arrived, Wall and several other Houston businessmen journeyed to Havana to meet with the Cuban leader at the presidential palace.